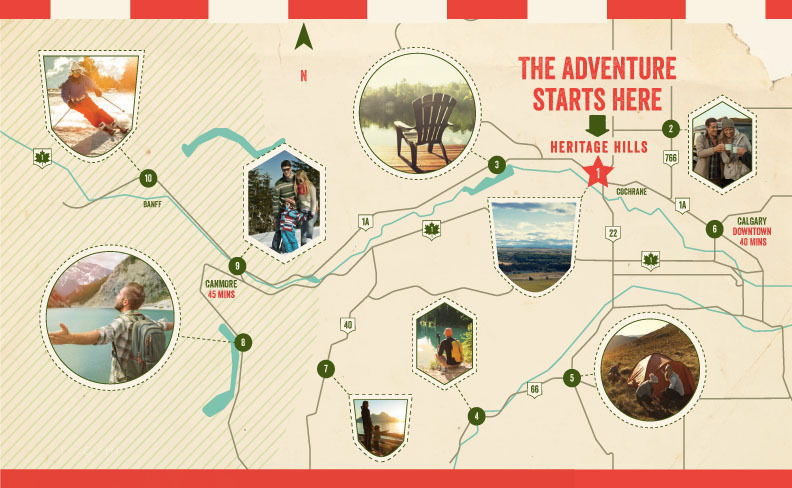 Heritage Hills of Cochrane has so much to offer new homeowners and growing families. With nine schools spanning grades K-12, parents can choose somewhere close to home. Not only is Cochrane primarily family focused, they have so many other attributes that make living there one of the best decisions you will make. With 85% of people driving to commute to work, it is a mere 15 minutes to Calgary and 35 to downtown. Cochrane is also the nearby resident of Calgary, Banff, and Kananaskis. Cochrane is highly known for its connection with nature and the great outdoors with an abundant number of parks and pathways, and only seven kilometers away from the Glenbow Provincial Park. Plenty of opportunities to enjoy some of your favorite activities including hiking, biking, camping, and skiing. Homes in Cochrane are among the most affordable in Southern Alberta. Best of all you really get that small-town feeling, with city amenities. The peaceful, quiet nights are much nicer than the sound of traffic and busy city streets. Heritage Hills was designed to get you more out of life. Cochrane is one of the most sought-after towns in Alberta, and is ideal for those looking to live next door to nature while enjoying a 35-minute commute to downtown Calgary. Residents of this hilltop community on Cochrane’s scenic and quiet west side enjoy more perks than just the view. The great outdoors are only great if you can get to them! Residents of Heritage Hills in Cochrane enjoy a quick and hassle-free commute to their weekend adventures. Get outside and into the action in anywhere from 5 to 45 minutes. Picture your summer weekends in the backyard, with your family, enjoying the breathtaking scenery of the mountains. Why not head out to the local ice cream shop that has been described as the best ice cream parlor in Alberta? There are a variety of great places to eat in Cochrane and many enjoyable restaurants for when you need a night out. Just over an hour drive to Banff, take the kids along for a ski trip and don’t forget to stop at the Fudgery! Imagine living amidst peaceful nature and beautiful mountain scenes. Homes in Heritage Hills come with the most exciting backyards around, but we’re firm believers in the great indoors as well. The stylish homes being built in this new Cochrane community take their inspiration from the natural beauty that surrounds them. The trusted and reliable home builder group crafting homes in Heritage Hills offers a variety of exterior styles, interior finishes, floor plan layouts and garage options. Homes are starting from the low $300’s. Visit our show homes today.